Temperatures on the East Coast warmed up on Sunday after a bitterly cold few days, and a warming trend is expected to start early in the week in many spots as a quieter weather pattern begins. At least nine deaths were blamed on the slick roads and authorities were investigating a few other traffic fatalities as possibly weather-related. Winter weather advisories had been posted from Denver to Bangor, Maine. Airports reported hundreds of flight delays or cancellations, interstates and toll roads reduced speed limits and authorities urged drivers to use extreme caution. 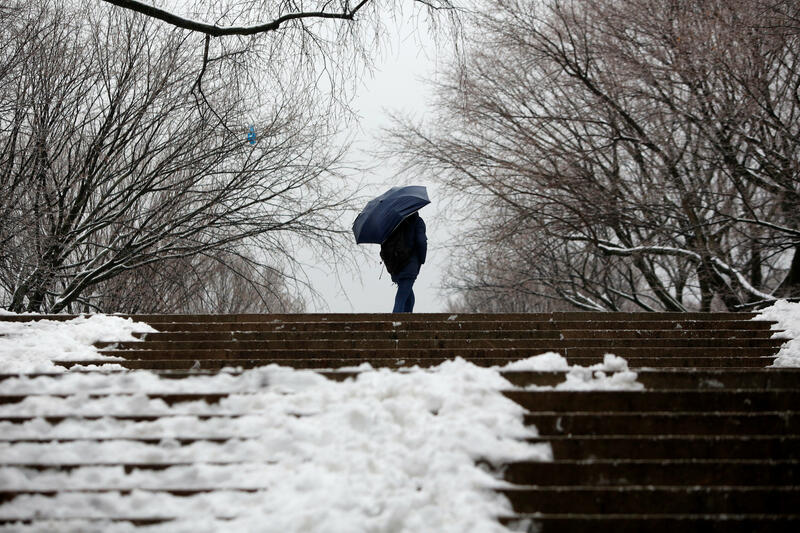 However, a warm front passing through the region pushed temperatures into the mid- to upper 40s in New York, the National Weather Service said. The temperature will take a slight dip Sunday night into Monday, but it won’t be as cold as it has been across much of the country, Engle said. The last few days have been more than 10 degrees below normal in many areas for this time of year, he said. Record low temperatures were recorded in cities across South Dakota, northwest Iowa and southwest Minnesota, while a blizzard shut down Interstate 90 in parts of Montana. The city of Huron set a new low for Sunday’s date in that location of minus 31 degrees, the National Weather Service in Sioux Falls, South Dakota, said. Another record fell in Marshall, Minnesota, where it was 31 below zero. Spencer, Iowa’s negative 27 degrees was a record-breaker there. And Bismarck, North Dakota, posted a new record low for Saturday’s date with 31 degrees below zero before midnight. Linton, North Dakota, was even colder with minus 33 degrees early Sunday. Wind chill advisories were in effect Sunday for parts of Nebraska, Missouri, Iowa, Illinois, Indiana, Wisconsin and Minnesota -- and Colorado residents were digging out after up to 16 inches of snow fell across the state. In southwestern Michigan, icy conditions appear to have played a role in a crash that killed a 73-year-old motorist. In Chicago, police said a commercial plane slid off a runway early Sunday at O’Hare International Airport. There were no injuries reported from the incident just after 1 a.m. The Chicago Bears host the Green Bay Packers Sunday at Soldier Field for what could be one of the coldest home games ever. The coldest Bears game at Soldier Field was on Dec. 22, 2008, when the thermometer hit 2 degrees with a wind chill of minus 13. On Sunday afternoon, extreme cold was forecast for the Great Lakes, Ohio Valley and New England. The weather service said the Gulf Coast region will have below normal temperatures for a few days. But a warming trend is expected to start early in the week in many spots as a quieter weather pattern begins with much less precipitation nationwide compared with recent days. With Christmas shopping underway and holiday travel gearing up, the nation’s midsection and East Coast were hammered by a winter storm bearing snow, freezing rain and often bone-chilling temperatures. The conditions spawned a multitude of highway accidents, some serious. There were dozens of crashes in Indiana - two of them with fatalities - due to freezing rain and ice. The roads were so slick that authorities had to move motorists stranded on an overpass with a ladder. In Ohio, a Columbus woman died Saturday when her car skidded off a slick road, authorities said. In Virginia, a Fairfax County firetruck slid off an icy road while responding to a crash, but no one was injured. In Colorado, up to a foot of snow fell in places, snarling traffic. Even weather-hardened locals apparently had trouble driving.